Melvin Felix Kerry Bright in what will be his new showroom. 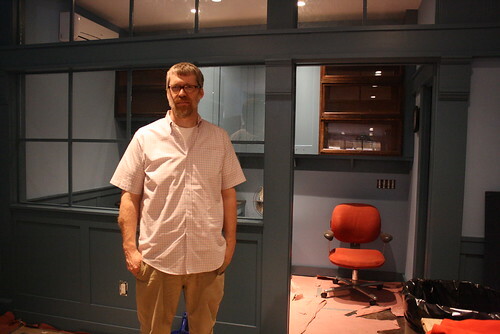 When Kerry Bright designed and built custom audio and video systems in the basement of 205 Avenue A, passersby would note the name of his company – Bright Home Theater – and buzz to ask about improv shows or to try to drop off their acting resumes. He’s hoping to clear up that confusion by opening a proper showroom across the street, under the name Bright Audio. After working as a general contractor specializing in home theaters for about 15 years, Mr. Bright spent eight years at 205 Avenue A, showing products by appointment only. He signed a 10-year lease across the street at 202 Avenue A, previously the studio of artist M. Henry Jones, and moved out of his old digs last week. His current clients, he said, range from do-it-yourself audiophiles in search of components to “very, very wealthy people,” including a couple of celebrities he couldn’t name. One of the high-end speakers featured on BHT’s website retails for $13,995 per pair.